This trip is now almost FULL – no more Novice or Intermediate Climbers. If you are an experienced trad leader, please contact Ollie as there may be room. Please note the change of date. 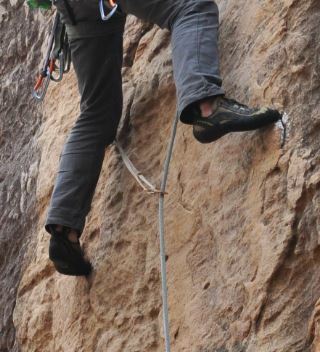 North Jawbone provides excellent climbing on high quality, chocolate coloured sandstone. Enjoy the excellent views and the long slabs on the first VCC rock climbing trip to the Cathedrals for a few years. It’s time to polish up your footwork and to get slabbing. Climbing in the ‘Cathedrals’ can be quite an adventure, with the crags often being remote and access requiring walks through rugged terrain. However, there are many little gems that await those willing to make the effort. The North Jawbone Crag overlooks the Cathedral Valley on the Eastern side of the Cathedral Range. Despite its steep appearance, North Jawbone is a reclining slab of about 60 degrees. Many of its climbs are multi-pitch and over 100m long on quality chocolate sandstone. There are approximately 53 documented routes at the crag and they range in grade from 3 to 23. Some popular two and three star routes include: Speigals Overhang 130m (10), Junglescope 140m (13), Fruit Hustler 40m (17) and The Mice Were Furious 130m (17). This is the first club rock climbing trip into the Cathedrals for a few years and the trip will be capped at twelve, so make sure you get in early to secure a spot. The trip is targeted at Advanced Climbers, with a limited number of spots available for Intermediate Climbers. Contact the Trip Leader, Ollie Sherlock, to secure your place.